Erin go bragh! It’s time to put on your green and celebrate the Irish because St. Patrick’s Day is almost here. Why not enjoy the holiday with some family craft time. Here are five fun projects to bring out the Irish in everyone. Turn your little cutie into a Lepri-cutie. Start with a paper plate. You can use big or small ones depending on the size you want your project to be. Paint the plate orange. 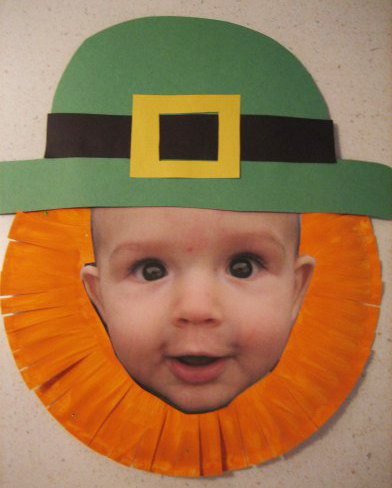 While it is drying make a hat for the leprechaun out of construction paper or other fun types of paper. Glue the hat onto the paper plate. Cut slits along the outer rim of the paper plate. This becomes the beard. For the finishing touch, glue a photo of your child’s face onto the middle of the plate. Now you have a Lepri-cutie to display. This simple craft can become a keepsake for you to hang up each year in March. 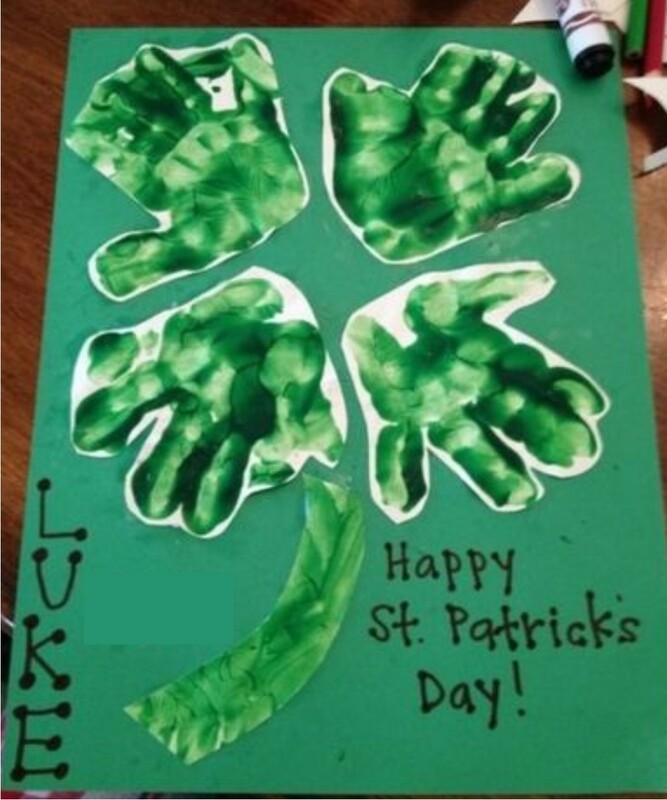 Using green paint, create four handprints of your child on white paper. When they dry, cut out around each print. Glue these onto a piece of construction paper in the shape of a shamrock. Paint a stem on it. Add your child’s name and the year. paper, about 12-20”, out of different rainbow colors. Cut the middle of out of a paper plate. Have your little ones glue or tape the streamers on the plate. They can then decorate the plate with stickers or crayons. When they are finished, put on some music and let them dance around with their new rainbow shakers. Here is another simple keepsake to make that will make you smile each year when you take it out to hang up. 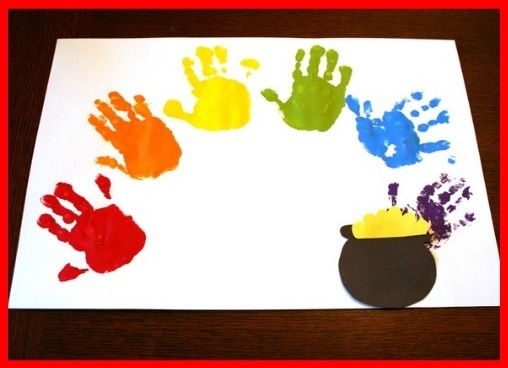 Using paints that are the colors of the rainbow, create a rainbow with your little one’s handprints. Then draw a pot of gold at the end of the rainbow or make one out of construction paper. Label with your child’s name and the year. 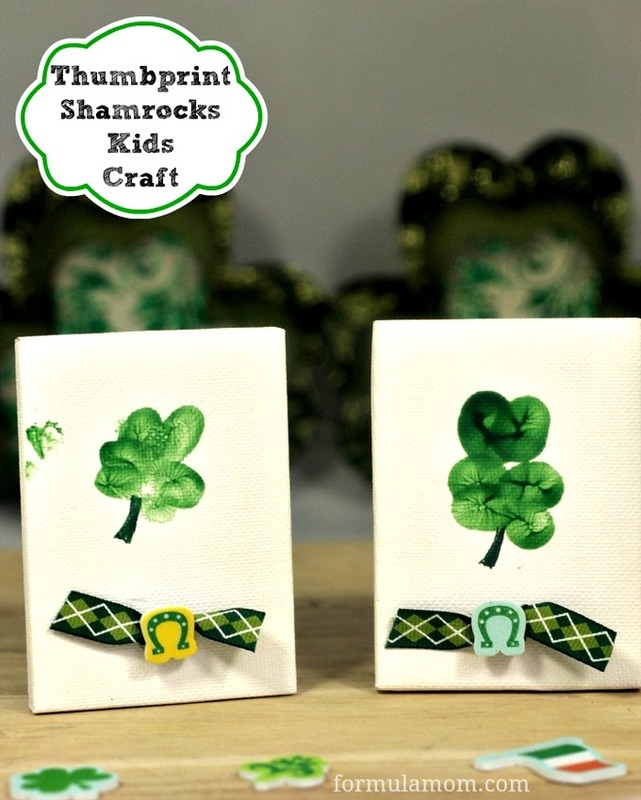 With a little paint, your little one’s thumbprints, and small pieces of tagboard, you can make these cute shamrock creations. Embellish each one with ribbon, stickers of markers. Use them as card to send to family and friends or hang them up around your house for decorations. In closing, here is an Irish Blessing.